Before we get into the details of these types of markets, first we must ask, “What exactly is niche marketing?” Niche marketing can be described as targeted marketing, a process in which you specifically focus in on on aspect of the market with a specific consumer base in mind. Your marketing efforts are concentrated, small, specific, and well-defined. In using this strategy, your newly established niche market will be able to withstand the competition of mass markets. However, one of the greatest challenges that the sheep industry faces when it comes to niche marketing is the biological process of seasonality. Sheep are considered short day breeds meaning that sheep will naturally breed in the fall and lamb in the spring. Therefore, fresh lamb is available in the spring and summer months, but in general there may be a decrease in availability over the fall and winter months depending upon you operations management practices. With this being said, it becomes a challenge to provide consistent products over the course of the year. However, through the use of good management and developing a great understanding of the market you wish to be involved in, producers are able to successfully make these systems work. Now that we have an understanding of what niche marketing is and some of the challenges associated with it, what niche markets are available to you as a producer in Ohio? Below are three potential niche markets to be involved in when compared to commercial production. As many of use know, club lambs or market lambs are animals that are raised by youth to be shown and exhibited at livestock functions. In recent years, this segment of the industry has obtained a lot of attention and is an industry that demands a premium. These animals tend to generate more income on a per head basis as compared to commercial production. The premium from these animals are associated with genetics and phenotypic appearance. There is also a great deal of emphasis on animal management (i.e. ensuring females conceive during breeding), nutrition (during the showing season), health, and marketing. This is an extremely competitive market to initially begin in, but once established is enjoyable. For those lambs bound for the holiday market, their name is exactly their intent. As the students outline in their attached poster, holiday lambs are those lambs that are produced and marketed in a timely manner to supply the increased demand of unique lamb during the holidays. Therefore, these types of lambs in this market are strategically born at a specific time of the year and raised to a specific weight depending upon the market of interest. During specific holiday seasons, lamb is a main course as a part of tradition. Therefore, lamb will demand a premium during these holidays. Below is a brief list of religions associated with specific holidays in which lamb is a center piece at the dinner table. One important thought to note. 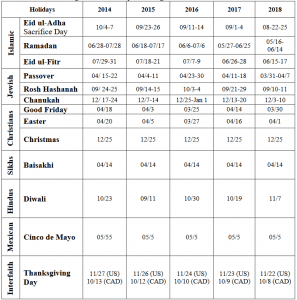 In some cases, these holidays will change from year to year, where others do not. Be sure to look at the calendar well in advance when making decisions upon what market you will be providing lambs for in order to make the appropriate management decisions. *An example of a holiday calendar is provided as an image above. 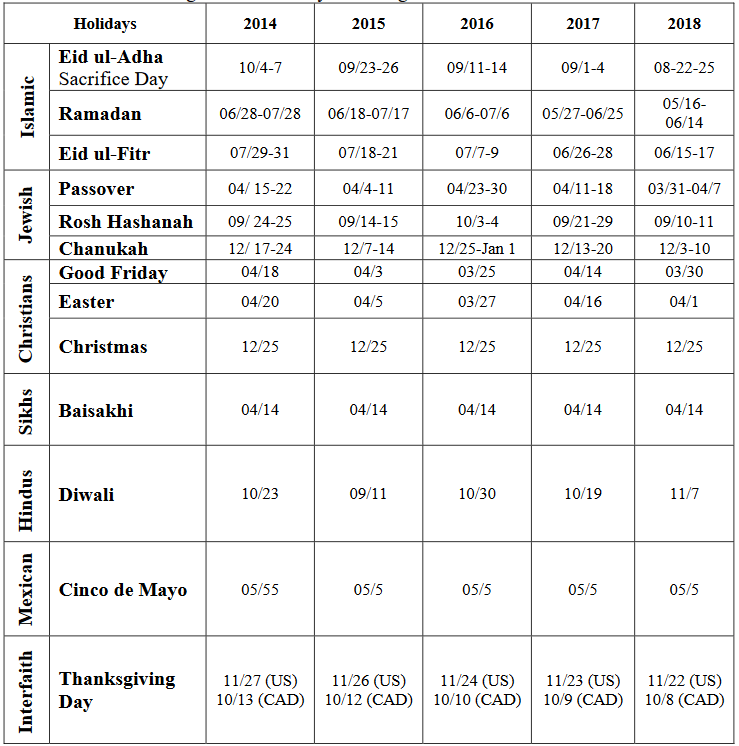 ** For the most up-to-date religious calendar events, please visit the Interfaith Calendar and select the calendar year of interest. Hot house lambs are also a unique set of lambs that you could offer on your operation in niche marketing. Hot house lambs are lambs that are lambs that are milk fed and typically born out-of-season (i.e. fall born lambs). Hot house lambs are generally marketed at lighter body weights (~25 – 60 lbs.). 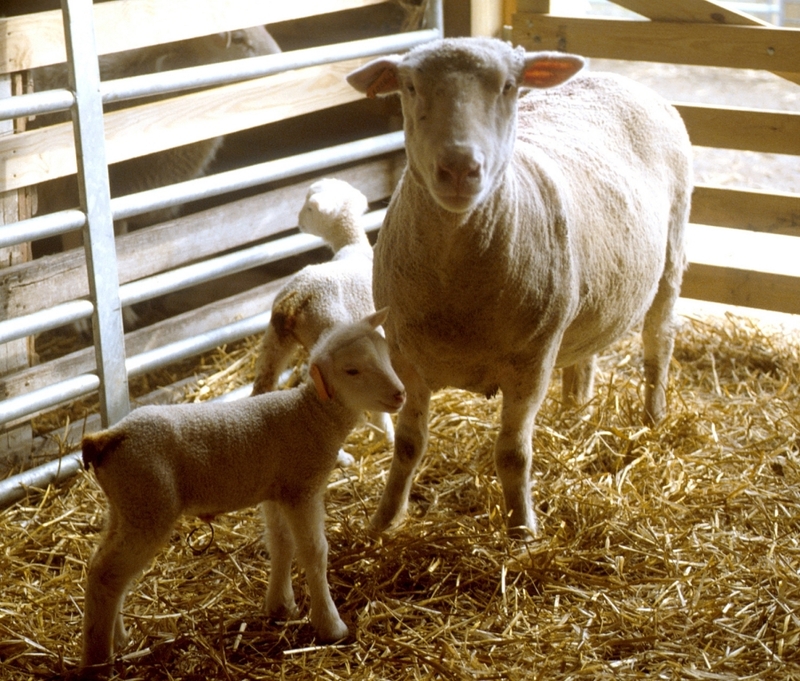 In some cases, producers will allow their lambs to nurse for 60 – 120 days and then market these animals at weaning. The benefit of this type of market includes decreased feed cost for growing lambs and may require less space as for a majority of the production cycle producers would only be managing their ewe flock. In addition, when timed correctly, some of these hot house lambs will also fit the market of some holidays, which will also demand a high premium. Regardless of the market you intend on selling in, be sure to do a background check. Make sure that you understand the product that is being demanded by the market and its consumer and during what time of the year. These two factors will great influence the management decisions in which you make on your own operation. Please note that when pursuing these types of markets, there will be an increase in production costs. For example, hot house lambs are typically born in the fall. The use of CIDR’s, exogenous hormones, and an increase in labor force may be needed in order to successfully produce these types of lambs. Be sure to make a budget. Calculating the benefits of achieving premiums in niche markets against the increase in production costs will also help lead you in the right direction when deciding which market to ultimately pursue. Posted by Braden Campbell at 8:00am January 4, 2019 Posted in Ag-note and tagged Management, Marketing. Bookmark the permalink.